My husband and I purchased our old Victorian home 25 years ago with the plan that we would remodel it into the home of our dreams. We’re small business owners who have been busy raising kids along with growing our business all these years. The result, well, we’re just now starting our journey of remodeling our house into our dream home. One of the first “big jobs” we are going to tackle is our upstairs bathroom. You see, our home was initially built in 1888 which meant there was NO plumbing at all. Can you believe it? No plumbing? Well, our bathroom upstairs was put in, we believe, during the 1940s and it hasn’t been updated since then. Along with updating the actual plumbing, our bathroom is in dire need of some new flooring. Since it has taken my husband and I 25 years to begin work on our home, we want to select products that will hold up to the test of time. Check out my pitiful bathroom that desperately needs some TLC (okay a lot of TLC). When I discovered Tarkett’s FiberFloor product I thought, “I’ve found my bathroom flooring!” FiberFloor is designed with woven fiberglass, foam and tough, resilient wear layers that stand up to real-life water, moisture, scuffs, scratches and indentations in a warm, comfortable and it-looks-great kind of way. See, a product that will last forever (well, virtually forever)! But that’s not all! Tarkett has a host of online tools to help you design amazing living spaces in your home. If you have difficulties finding “the right color palette” your room, Tarkett developed iSelect, a selection of FiberFloor products organized into six easy-to-shop palettes, to help you design palette that suits your style. 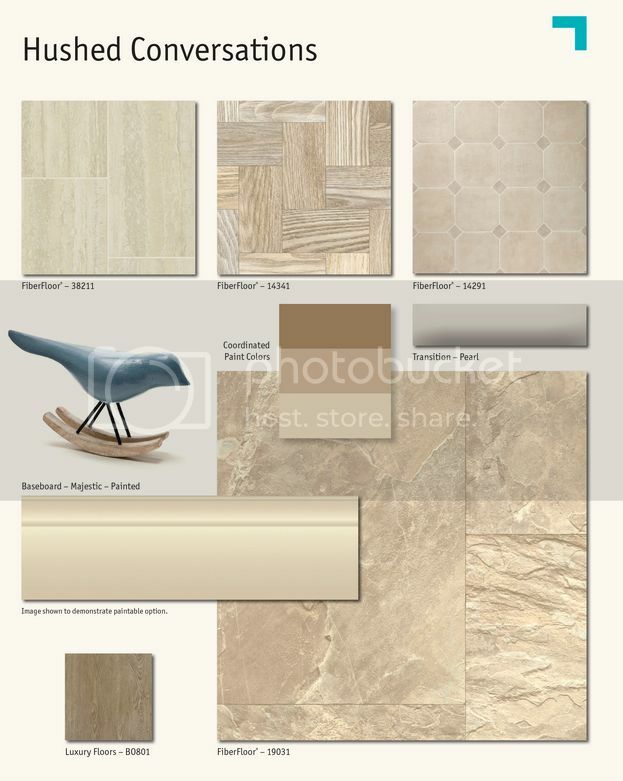 The color palette that I think would work beautifully in a bathroom is Hushed Conversations. Do you like it too? I’m also excited to share with you that you can Visualize your room at RoomVue, a great online tool that TarkettNA has available to assist you in selecting you new flooring. Here, I uploaded the photo of my bathroom into RoomVue. Now, here is my after photo with my first selection. I think this RoomVue tool will definitely come in handy when I’m making my final flooring selection! But support isn’t limited to do-it-yourself tools. I can even chat online with professional Designers both during the week and on weekends to answer questions about room design, flooring options and product details. I’m super excited to take my “new” bathroom from dream to reality! Tarkett has over 10,000 retailers across the country! Yes, you read that correctly….ten thousand! I’m an old school shopper where I do like to see things in person before I purchase. If you too are a “showroom shopper”, you can locate the retailer closest to you by going to HERE. To keep up with all that is new be sure to follow Tarkett on Facebook and Tarkett on Pinterest….I know I will! Which room in your home desperately needs a new floor? « Wednesday Wisdom – The No-Fail Nap Time Trick!